Map courtesy of Zara Matheson of the Martin Prosperity Institute. In a brilliant series examining venture capital (VC) investments–money largely invested in technology-based sectors–urban guru Richard Florida has taken data from Dow Jones and broken it down in maps and context. The macro-point is–in Floridian style–quite simple: though San Francisco/San Jose still account for an enormous chunk of VC investment, said investment is spreading into urban neighborhoods. And the data encourages me to pose a question that I seem to pose all too often: Where, oh where, is Long Beach? As always, the Shadow of Los Angeles paired with the White Glare of Orange County proves Long Beach to be the hard-to-look at contrasted center. 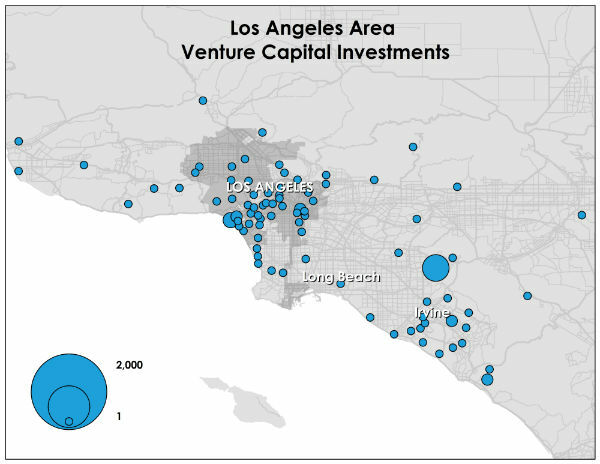 In this case, the shadow of West L.A.’s massive boom in VC investment–over $450M from Santa Monica to Westwood alone–and the glare of East Anaheim’s similar boom–a staggering $531M, the largest single core of VC investment in the entirety of Southern California. This shift of the high-tech sector from suburban to urban is, as Florida points out, antithetical to the well-known Brookings report a decade ago which predicted jobs in that sector would reside in self-contained, high-tech suburban places like Irvine–which actually fell behind the more dense areas of San Diego, Anaheim, and L.A./Santa Monica in amount of VC investments. So where is the LBC? Is it at the over-$100M with comparable cities in size–Portland, Cleveland, Denver–or industrial strength–Detroit, Baltimore, Dallas? Maybe? Long Beach hovers at a paltry $9.52M in 2011, which was gathered for a single deal; the data was provided by Florida. I share his confusion: For one, the growing disinterest in Irvine could be explained by its utter lack of transit and being walkable; its Walkscore currently sits at a sad 54 compared to Long Beach’s 66. This is, amongst young professionals, unwelcoming since where they live and work become cogs in how they happily function: driving everywhere all the time is not as jealous-inducing as someone who is able to enjoy a plethora of restaurants and take their food to a park on their lunch break without breaking a sweat. This could partially explain downtown Santa Monica’s enormously large VC investment, which is the second-largest concentration in Southern California: its overall Walkscore is 82, with its downtown core–which harvests some $286M in VC investment monies–holding an astounding 95 (still above Long Beach’s highest-marking area, Downtown, at 89). This makes almost any point about traffic issues along Silicon Beach somewhat moot. And even more, when paired with the fact that they have a shopping district that isn’t run-of-the-mill nearby–something we all know Downtown Long Beach, probably the most viable space for a tech core if we were to have one, severely lacks–it is no wonder people want to work there as well as invest there. This isn’t to say there haven’t been talks about growing Long Beach’s tech sector–often to the extent of being overtly optimistic in nature. John Grefe of Long Beach Tech–a non-profit dedicated to encouraging profit-oriented technology startups–noted in an op-ed introducing a techy focused column for the Long Beach Business Journal that Long Beach has a “technology footprint [that] is growing fast.” However, his only direct proof was the mention of a mobile app developed in the Zaferia District on the East Side and mention of CSULB tech students (which doesn’t necessarily equate to tech startups right here in town). Eric Gray followed up with the second article in the column series in a similar fashion: equally optimistic but more specific, noting cheaper rent amongst a list of other pluses. Ultimately, this comes down to a different discussion: Addressing reasons as to why Long Beach could be a great space to harness one’s investment is a tad redundant. More than defending its capability at hosting VC investments, the question we need to address is more city-reflective than deflective: Why are we missing out on the SoCal tech boom? That image is highlighting the port and San Pedro, not Long Beach. Though, it is disturbing the venture capital investment area in Long Beach is by the airport (not exactly a transit friendly area). Hold on, even though Santa Monica’s overall walk score is 82 versus LB’s overall score of 66, you have to keep in mind that LB’s score includes 3x as much area, including the very unwalkable North Long Beach and East Long Beach. If you compare the entirety of Santa Monica with a roughly equally sized part of the Long Beach core (looks like it would have to be from the beach to about Hill and east to Belmont Shore), it seems like LB’s walk score would be very close to Santa Monica’s. As noted in the article, Long Beach’s highest-marking area, Downtown, sits at 89 while Santa Monica’s Downtown holds one of the highest in the nation: 95. Yeah, definitely. I agree Santa Monica still has the edge, I just wanted to point out that LB’s not as far behind in walkability as the overall numbers might make it seem. Is there more data on what the startups receiving these investments are? Never heard of a tech boom going on in North Orange County until now. For sure though past success equates to more future investment in the startup world which is likely the biggest reason why Long Beach is largely left out here. Would also be interested in see which industries/companies are largest in LB. Molina Healthcare is pretty big I think. The Port of course. After that, commuting? East Anaheim is way less dense than downtown Santa Monica and has a much lower walk score. And yet somehow, it has nearly double the VC investment. Wait, so now East Anaheim is urban but Irvine is suburban? I’m not sure why everybody focuses so heavily on tech sector and VC. Realistically, there is only so much tech investment to go around, and after a certain point, cities are throwing away tax money to chase it. Kind of like how everyone used to want automobile manufacturing plants, to the point where the entire industry in Detroit was cannibalized by the South. Let’s just worry about building institutions that encourage businesses of all types to grow, and providing the education, transportation, etc. that lets everyone take advantage. Is this high tech enough for ya? However, I view my job as protecting inventors FROM vulture capitalists…. I take issue with this statement. Maybe “moot” if you live close enough to the westside where the commute is bearable. But for those of us that live outside of the area, commuting into that area is a hellish nightmare. As a resident of Long Beach who works OC, I’d love to see LBC grow the tech scene as a much more sane and viable alternative to the over-congested (and expensive) west LA, and the blandness of Irvine. LBC is cheaper, has an airport, public transportation, great restaurants, great weather, etc., plus of burgeoning group of talented and vibrant folks sincerely interested in growing the tech community. I think it will take getting a bigger anchor, like a Google, Yahoo, Facebook, etc. to open some offices here to get some momentum going. 23. Denso Sales California, Inc.
Did you ever find out which companies in Anaheim are getting all this VC investment? Not really, Anaheim is more density populated than Santa Monica because it over 50 percent latino and several people live per household. You are thinking of the hills. Walkability has nothing to do with it. Santa Ana is almost 12,000 per square mile and Anahiem about 6,700 while Santa MOnica is probably only 5,700 people per square mile. It’s probably all of the vendors who sell thru Ingram Micro which was bought up by a Chinese conglomerate. It may sound nice on the surface but it can’t bode well with foreign capital dictating the vibrancy of local economies. Great article, even though I’ve just come across it 3 years later. Yah I just found this too. This is something I find very interesting. It’s a problem I have seen before. Now to figure it out. Hi Mike, would love to connect. Please find me on FB or Linkedin. Thanks! 2012: Another Big Year for Motorized Transit in L.A.